When it comes to looking at the most popular cars made and sold today, few companies can compete with Toyota. This is especially true when speaking of economical cars. Toyota has long been known as one of the best economy car makers in the world. Of all the cars that Toyota manufactures, the most popular by far is the Toyota Camry. Through the years there have been a number of changes to the Toyota Camry. What started out as a pure economy car has evolved into one of the nicer affordable semi luxury cars on the market. For a brief time, the car that would become the Toyota Camry would be known as the Celica Camry. This vehicle was launched in 1980 and was primarily made available only in Japan. The car was a combination of elements of the Toyota Celica as well as the Toyota Carina, and was a rear wheel drive automobile. It wasn’t until 1982 that the Camry emerged as its own independent line of automobile. The car was made available in four door and five door hatchback versions and kept with the box type design of the early 1980s. The Camry was available from the start with either a five speed manual transmission or a four speed automatic and both models were front wheel drive. In 1986, the Camry was retooled and the second generation of the model was released. This time around the line included a station wagon as an option and the hatchback model had been dropped from availability. 1987 saw Toyota manufacture the first Camry outside of Japan when production began in Australia. By 1988 a fuel injected V-6 engine was added to the long list of options and the car still qualified as a compact. Production of the Camry began at the Toyota Motor Manufacturing Kentucky plant in 1988, where including the base model, the DX, and the LE, three different versions were manufactured. 1989 would see the 1.8 litre engine dropped from the line to be replaced by a carburetted 2.0 litre engine. These late 1980s models manufactured in the United States remain popular to this day. While Toyota had updated the Camry in Japan in 1990, the main design wasn’t changed on the United States models much until the release of the third generation models in 1992. These new models consisted mostly of body styling changes including larger grilles. For a short time, Toyota began producing two door coupe versions of the Camry as a direct way of competing with Honda’s Accord Coupe. These two door versions were phased out by 1997 only to be reintroduced as the Camry Solara in 1999. The fourth generation Camry was again primarily a Japan-only release for Toyota, with most major changes to the model waiting until the fifth generation Toyota Camry saw the Japanese and export versions of the car come in line with each other in 1996. These 1997 model Toyota Camrys saw a huge bump in popularity with Camry going on to become the number one selling automobile in the United States for nine of the next ten years. The year 2000 would see the Camry get some major body retooling, but other than that it remained largely the same. 2001 would see the Camry receive an increase in power, eventually including an option for a 3.0 V-6 engine. As popular as the Toyota Camry had become, there were no major upgrades until 2002 saw the release of the sixth generation of the car. The Camry’s body was completely redone this time around as a larger sedan, owing much of the look to the Solara model that had begun to separate from the Camry line just a few years before. It was at this time that Toyota dropped the Camry station wagon from production, replacing that model with both the Sienna minivan and the Highlander sport utility vehicle. The sixth generation Camry was noticeably taller and longer than its previous versions. The length was however deceptive though because the front of the car appeared to relatively shorter while the riding area of the vehicle was enlarged. 2004 and 2005 saw exterior upgrades like a new grille, new headlight and taillight design, and bumper redesign. Interior upgrades saw things like storage areas in the doors, new gauges, and steering wheel mounted stereo controls. Toyota would once again redo the Camry when it released its seventh generation in 2007. 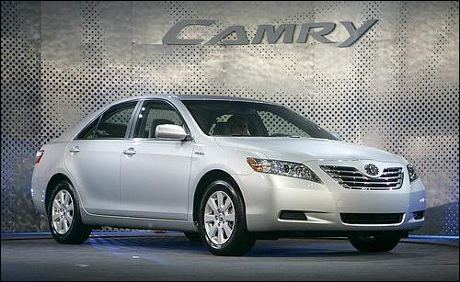 The highlight of the 2007 Camry would be the availability of a true hybrid version alongside the standard engine models. The wheelbase was lengthened for this version of the Camry and the trunk space was decreased by a bit. Buyers now had a choice of ordering their Camry with either a four or six cylinder engine. The four cylinder engine was available with either a five speed manual or five speed automatic transmission, while the V-6 came with a six speed automatic transmission only. This seventh generation Camry also came straight out of the factory with full airbags, a tire pressure monitoring system, ABS, and Brake Assist. All of these additions significantly boosted the Camry’s ratings in crash testing experiments. The continual upgrading that the Camry has undergone through the years has only enhanced the popularity of the vehicle. Though consistently changing the vehicle, Toyota has always kept its eye on the customer that the model is aimed at. The Camry has proven to be the ultimate economical and family car. The recent models carry with them a decent amount of luxury for the price they are offered with and customers who buy the Camry have apparently been appreciative of this based on how well the Camry has sold. There is nothing in the future that appears to be able to slow down the popularity, and model sales, of the Toyota Camry.